MIAMI, January 14, 2013 – Azamara Journey, the second of Azamara Club Cruises’ twin boutique ships to undergo refurbishment, emerged today from an eight-day drydock in Singapore’s Sembawang Shipyard. 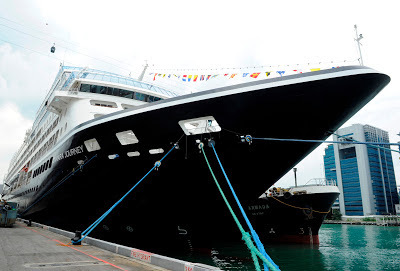 Azamara Journey, now complete with a refresh of all public spaces and staterooms and an elegant new “Azamara Blue” exterior hull, continues its Asia season with a 13-night Indonesia voyage round-trip from Singapore. With its newly refreshed ships, the cruise line that sails to exciting destinations around the world that larger ships are unable to reach is poised to break away from its category. Azamara features longer stays and more overnights in port to present up-market travelers the opportunity for night touring. Paired with the new complimentary AzAmazing Evening event on every voyage, starting with each ship’s Europe 2013 season, Azamara is delivering to guests the most authentic, intimate and bespoke travel experiences that showcases the nightlife of some of the world’s most intriguing destinations. Shipwide renovations included new carpets, upholstery, and a new color palette in public spaces reflecting the cruise line’s inviting atmosphere; new mattresses and upgraded veranda furniture for suites and staterooms; and a resurfaced pool, and new sun loungers and pool towels on the outer decks. The Casino Bar also was expanded and enhanced with new furniture, while the Spa and fitness center was refreshed with a new steam room, showers, and state-of-the-art Life Fitness cardio equipment. Furthermore, a range of enhancements were made behind the scenes in the staff and crew areas to add to the comfort of the cruise line’s most valuable asset. On the culinary front, guests can now enjoy a new caviar and champagne bar within Aqualina, one of the ships’ two specialty dining venues, as well as a new Chef’s Table concept featuring three wine degustation menus – Italian, French and Californian. At Mosaic Café, the ships’ central gathering spot, guests can purchase a freshly brewed cup of bespoke coffee or tea. Guests aboard Azamara Journey enjoy more inclusive amenities, such as included gratuities for housekeeping, dining and bar staff; complimentary bottled water, sodas, specialty coffee, and teas, as well as complimentary red and white boutique wines to accompany lunch and dinner; complimentary self-service laundry; English Butler service for suite guests; and shuttle transportation to city centers in ports, where available. Azamara Club Cruises is a destination-immersive cruise line for up-market travelers who not only want to see the places and cultures they visit, but to live them. Azamara’s two intimate, 694-guest ships, Azamara Journey and Azamara Quest, with a combination of 347 suites and staterooms, offer a European-boutique hotel ambience with extraordinary service, fine cuisine and wines from around the world, and wellness and vitality programs, all while sailing to a host of destinations larger ships cannot reach. Azamara Club Cruises sails European destinations, including the Baltic and Scandinavia, British Isles, Western Europe, French and Italian Rivieras, Greek Isles, Croatia, Holy Land and Black Sea, as well as Asia, South America and lesser-traveled islands of the West Indies, with more overnight and late-night stays in every region. Travelers also can choose even more immersive experiences with Azamara cruisetours in eight of the world’s most exciting destinations, including Rome, Athens, Buenos Aires, Cairo, Istanbul, Jordan and Israel, India, and China. For more information, travelers can call their travel professional, dial 1-877-999-9553, or visit the Azamara Club Cruises at www.AzamaraClubCruises.com. Follow Azamara Club Cruises on Facebook at www.facebook.com/AzamaraClubCruises or on Twitter, @AzamaraVoyages. Travel agent professionals can also access more information and make reservations at www.CruisingPower.com. Royal Caribbean Cruises Ltd. (NYSE/OSX: RCL) is a global cruise vacation company that owns Royal Caribbean International, Celebrity Cruises, Pullmantur, Azamara Club Cruises and CDF Croisières de France, as well as TUI Cruises through a 50 percent joint venture. Together, these six brands operate a combined total of 41 ships with three under construction. Silversea details 10 exquisite "Grand Voyages"